Francis Vallejo | blog: Stolen Images...COPYRIGHT INFRINGEMENT!!??! I thought I would do my part and help spread the word on an unfortunate situation affecting many artists in the illustration community. 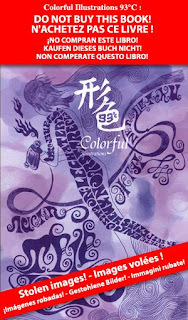 A Japanese (allegedly fake) bookmaker just released a illustration compilation book named "Colorful Illustration 93 C. They basically just ripped off a large amount of illustrator's work and stole all the exclusive interviews from Darren Di Lieto over at the Little Chimp Society. This is bad news. The ISBN is fake as is the phone number on the book. They knew they were doing illegal activity and really covered their tracks. PLEASE DO NOT PURCHASE THIS BOOK!!!!! P.S. All artist should also become aware of the situation with the Orphan's Work bill and the effect that it will have on how we handle our artwork. i found your blog, and it made my day, i fell in love with your style! lovely, great, huge, lot of magnetism here!! i really enjoyed all your artworks!! keep on rocking! BTW, this book is a disgrace. Good job on letting people know. You're absolutely right, that's just wrong! I can't believe these people have the nerve to make money off other people's hard work (hundreds of hours painting) and interviews to make profit. As an art community, all artist and fans should really look into that "Orphan's Work" bill. Read it through at least once and make sure to follow up on writing your congress men, etc. We need to work together to prevent this Orphan Work becoming a bill. Who has the funds and time to register every piece of work you create? It's bad new everyone. Cheers! my work was stolen in this book too. i actually saw it for sale in the Gallery district of Beijing last year.